Dog agility training is fun! It sharpens your dogs mind, helps their coordination and you and your dog will build a better bond. We encourage all dogs to have trained for and passed their Silver Good Citizen Award in Obedience before starting in any agility classes. These are also available at Dig It Dogs - please visit our Obedience page for further details. You may complete one course at Dig It before deciding to continue with training at the club after which you are asked to join Dig It Dog Training Club to take part in any further classes. Check out the About Us page for membership details. We also run club competitions and our own agility shows. 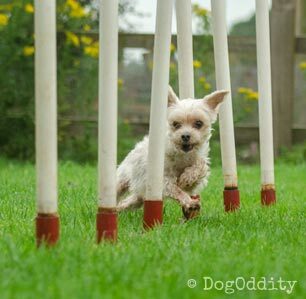 If you are new to the sport of agility then we have weekly classes which will allow you to 'have a go' and see if agility is for you and your dog. The course is the first level on our Agility Foundations progression system for beginner dogs. It is a 7 week course, which includes an assessment on the last week. We run lots of useful short courses with guest instructors that can improve or teach you and your dog specific skills. For all our agility workshops and special courses please check out our EVENTS page. Friendly, relaxed atmosphere, clear instructions, encouraging tips for everyday life! Please make sure that your vaccination certificate is up to date and that your dog has been wormed. Please get worming medication from your vet. Although more expensive than in the shops it is more effective. It is also a advisable to have an up to date kennel cough vaccination to ensure you dog will remain in the peak of health. Choke chains (check chains) are not allowed during the agility classes. Recent studies have shown that not only can they damage the dogs neck, but they also cause physiological problems and aggression in some dogs. We use a variety of methods to motivate your dog in the classes. If your dog is not particularly treat orientated then being along his/her favourite toy to play with and use than as a reward instead. Fleece tuggy toys are great for agility – available from the club shop. Bear in mind that we want your dog to work well for the treats you use in class, so if he has just had lunch/super, he’s not going to work as well as he could. Feed him within 3-4 hours prior to the class. On a full stomach the dog will not be very comfortable running round and there is also the chance that a full stomach can twist – which we definitely don’t want! You must enter the AGILITY ARENA at the small door at the opposite end of the building to the parking which is signposted ENTRANCE. DO NOT use any equipment with out instructor supervision, this is dangerous and there is plenty of time in the classes for your turn. A calm and confident attitude will help your dog to settle into the class easier, by walking around the equipment and allowing your dog to get used to the new surroundings will help promote calm behaviour.